On the left side of a football pitch in an American football game, we typically see guys that are a lot more undersized compared to their counterparts on the right, but their speed and athleticism equally match up to those on the right if not better with some individuals. However, still, on this left side, we have someone like Trent Brown who can be rightfully described as a giant both in height and weight match up to those little-left side guys in athleticism and in addition, performing better than them with his sheer power and size. His size and what he does with it in the National Football League (NFL) has been a topic of interest and here you will get a deeper insight into it, in addition to background knowledge on who the footballer is. Biography & Age – Who is Trent Brown? 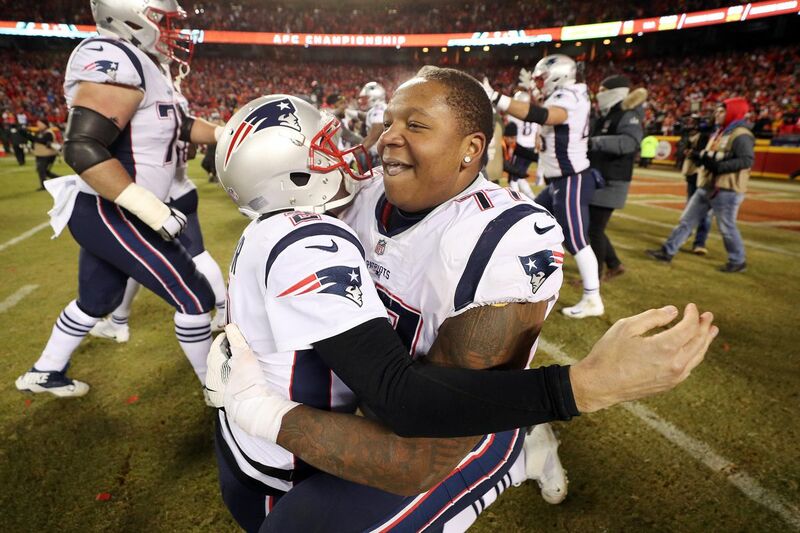 Trent Brown is an American footballer who was born on April 13, 1993, and was given the full name Trenton Jacoby Brown at birth in Bastrop, Texas by parents Reginald and Tiffany Brown. Though Trent was born prematurely a month before he was due, the tot came out very big at 6lbs 9 ounces and he kept growing from then on. For school, Brown was first enrolled at Deerfield-Windsor School prior to his transfer to Westover Comprehensive High School where he would come to finish off in 2011. In his first 2 years of high school, he was an avid basketball player taking after his father who played college basketball in his own time. However, by his junior year, the baller made a switch to football and this was still okay with his father who in the footballer’s words, was very excited and very proud. Coming into college in the fall of 2011, Trent Brown began playing for the GMC Bulldogs of Georgia Military College in Milledgeville, Georgia. He played impressively in his two years with this team leaving no one in doubt of how good a player he was. Jacoby was thus named to the 2012 National Junior Collegiate Athletic Association (NJCAA) All-American second team which attracted the interest of various National Collegiate Athletic Association (NCAA) division one schools to get him over to their school. He, however, chose the University of Florida and by May 2013, Brown joined his Florida Gators teammates. In his early days with the Gators, Trent was used mainly on field goals and the I formation in short yardage scenarios. When his team’s first choice offensive guard Tyler Moore was out for the year as a result of an injury, Brown began playing as a starting guard in 2014 which he maintained till he graduated. Trent Brown entered the NFL as the 244th overall pick in the 7th round selected by the San Francisco 49ers. In his rookie season, he played in a total of 5 games which were fair enough to prove the good use he can put his size, length, and wingspan to. In his second season with the 49ers, Brown played in all 16 regular season games before he played 6 less in the following season as a result of a shoulder injury which saw him off to the injured reserve list on December 16, 2017. His next NFL season, however, saw him as the 143rd selection in the 2018 NFL Draft (Ja’Whaun Bentley) being traded off to the New England Patriots in exchange for the Draft’s 95th selection (Tarvarius Moore). Trent Brown on joining his new team became their starting left tackle which is a switch from his right tackle position with the San Fransisco 49ers. In his first season with the Foxborough, Massachusetts based team, he played all 16 regular season games in a spectacular fashion with his size and athleticism. We have severally made reference to how big Trent Brown is but haven’t mentioned his exact stats. How big is he really? The Patriots Offensive tackle stands at a height of 6 feet 8 inches or 2.03m and at this height, he is the heaviest player in the NFL with a weight of 380lbs or 172kg. Trent has an arm length of 36 inches or 0.91m with a hand size of 10 7⁄8 inches. After his junior college football career, University of Arizona, Mississippi State University, Texas A&M, Louisianna State University, University of Kansas, University of Georgia, Louisianna State University, University of Oklahoma are the schools that wanted him. The American footballer has amassed career earnings of about $3.6m. He is a very close friend of Von Miller and even trains with him during offseasons in Miami. At his size, traveling was often a problem with him but with his teams’ new “Airkrafts” it is a problem solved. Trent Brown’s father Reginald is a cop and was on active duty during Hurricane Michael which ripped through Brown’s hometown of Albany, Georgia. Their house was however saved during the hurricane.